You need an action plan when you are working on a task which is not a project and not a simple BAU task. Having an action planning template ensures that the task in question is planned by considering the goals, timeline, risks, and dependencies. Start with understanding the reason why you need an action plan. You need to understand why you are required to this using an action plan and not as a project or a simple task. Typically, you would be solving a problem or fixing something so understand the problem and always good to have a timeline of things have unfolded. Reviewing the Root Cause Analysis or Project Closure document will give you some background on the issue for which an action is required. Write down the end objective or goals of the action plan. Ideally, have a max of 2 or 3 goals per action plan. Understand the steps involved in fixing the issue and come up with a 3 – 4 high-level tasks which can be tracked in blocks of 3 -5 days. Understand the business impact of what you are trying to do. It is helpful in motivating people if you have real life or financial impact information about a given issue. Publish and review the draft with senior managers beforehand to avoid surprises. Ensure the plan is published to everyone who is affected by the issue or will be part of the action plan. So, if you need resources or assets from someone team then they should be on the distribution list. Include all the powerful people on the distribution list to ensure you get the support required. Always include buffer or contingency in your timeline for the plan so that you can accommodate unknown. There will always something or someone who will have a different priority. Clearly, list out the dependencies and resources you need to make the plan actionable. Without getting a commitment to resource availability and assets the plan is bound to fail. Seek approval from key stakeholders in writing for the final plan. One easy of doing this to organize a meeting and walk everyone through the plan in the meeting. Then as a follow-up send minutes of meeting to ensure everyone is on the same page. Publish the updated action plan regularly(after the initial publish) so that people know how it is tracking. If you do not provide everyone will assume that everything is on track and the plan is on track. 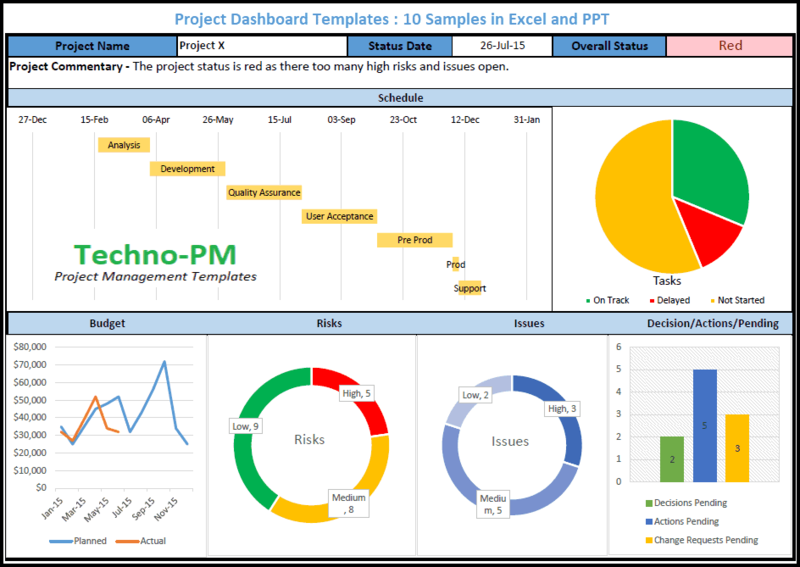 This Action plan template not only allows to plan and execute in a systematic manner it can also be used a status report for the plan. 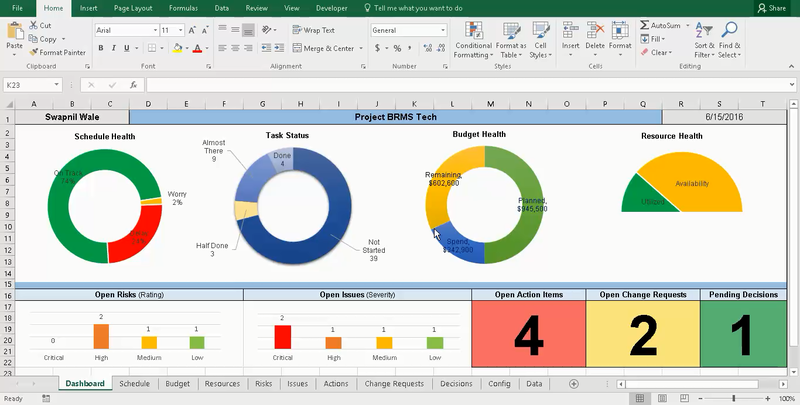 The template starts by capturing the basic information about the title or name, description, date and time when the plan was drafted and the nominated champion. The nominated champion is the person who will own and run this initiative will do the co-ordination tasks including drafting and maintain this plan. This section should clearly document what are the goals or objectives that you want to achieve by implementing this action plan. Try to keep the goals to 2 -3 maximum so that you and everyone reading the document is clear about your objectives. The action plan timeline should contain start and end times of high-level phase on the plan with % progress complete. The status should be On Track is all is good, Worry if might slip and Bad if already delayed. When you have a status Worry or Bad always enter a comment as senior management will want to know why the task had not progressed as planned. An action plan drives change in some of the other form. With any new change comes an inherent risk of something not working as expected or at the least people not accepting the change. In this part of the plan, you will first assess the impact of this change on business, customers, technology, brand etc. It is important that you highlight the right risk levels. If things go south after the action plan is implemented you will have proof that you had raised these issues upfront. You should also include any risks associated with the plan. The risk could use users not accepting the solution, change in process or implementing a fix which is not 100% tested. Ensure you use this opportunity to get the attention to whatever concerns you have. 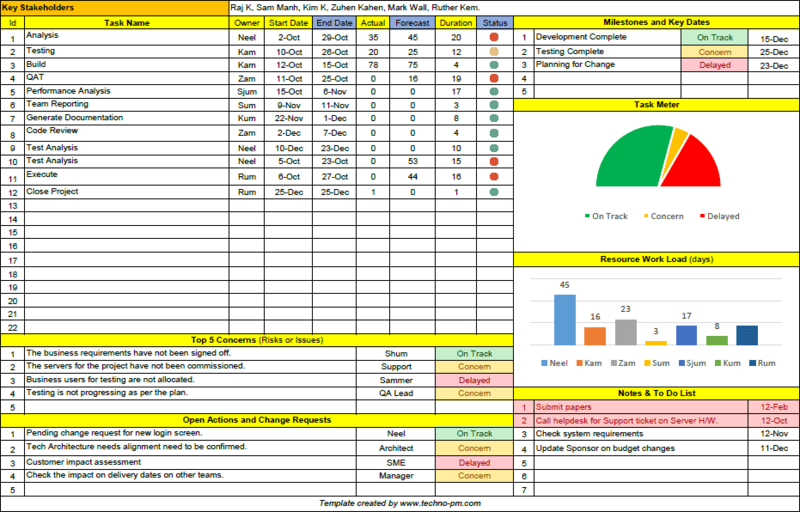 Use this part of the action plan to document all the dependencies and resources you need to implement the action plan. Ensure to note different people you will need from other teams,. With dependency highlight any potential tasks or events which may be pre-cursor to successful completion for the action plan. Description: Due to the recent software upgrade some of the test servers are having an issue of memory leak and often stop responding during integration testing. Identify the root cause of the issue by analyzing all the clusters. Present the findings to CCB (Change Control Board). Test and develop a break-fix patch with the fix. Run performance tests on servers to ensure the fix has worked. Provide maximum time to the first task as that is more exploratory type task and could take longer or shorter depending on the issue. Also depending on how fast your organisations can promote changes pick a week for the rest of the tasks. Like mentioned before ensure you have allocated an adequate buffer. The business and customer impact should be low as this is a test environment. There could be potential technology impact depending on the issue found. If the underlying issue is severe than it would need a major change in the technology stack. The initial step might reveal a much more complex problem which could mean the timeline expands. The resources allocated to the task are not full time so may not be fully effective if they break their analysis into parts. The fix might need complex change to the architecture which might need more resources. ABAP developer needed for two weeks. The plan is dependent on projects finishing on time/ if the project gets delayed then the plan will need to be revised. QA resource required to do performance testing.